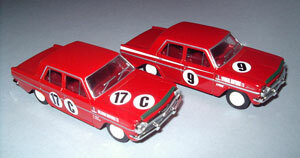 Above: This model starts out as the Scuderia-Veloce Dealer team EH Holden S4 of Spencer Martin/Brian Muir that raced in the 1963 Armstrong 500 (Bathurst) as modelled by Trax TR5E. The Task? 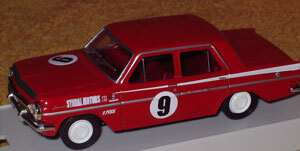 Convert it into a representation of the car driven by Victorian David Price in the mid to late 1960s. 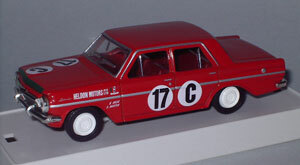 Ironically, Price purchased the very car that Spencer/Muir raced at Bathurst, so converting this model is replicating what happened in real life! Above: The EH with all un-needed markings polished out and ready for new decoration. 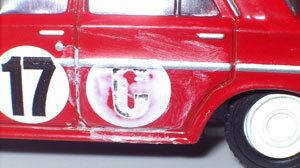 Above: The decals stuck well and were opaque enough for the colour and markings underneath not to show through. 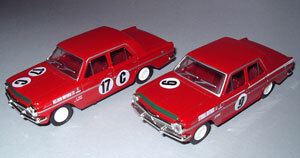 For example, the #9 sticker went straight over the #17 and totally hides evidence of the 17. “Syndal Motors” and “D. 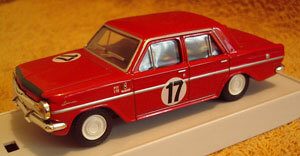 Price” are printed on clear film – in 1:43 scale we are talking mere millimetres in height here. At this small size the clarity of the print has suffered a little. The white side panels were cut from vinyl and applied. The door handles were exposed by cutting the vinyl afterwards.